Dr.Paul MacCready and Dr. Dan Rivers, now of Aerovironment and Compact Power respectively, both appear to be as convinced as we are that a new generation of pure battery vehicles really could be just around the corner - this despite the carefully-doctored drip-feed from the media of EV-bashing fuel-cell hype and myth-information. OK - this isn't quite "breaking news" yet - but even to tired-of-waiting EV campaigners like ourselves - this definitely looks like potential headline news-in-the-making...a developing story of two distinguished EV visionaries, now going their not-so-separate ways, but who still clearly both believe - now perhaps more than ever before - in the imminent triumphant emergence of a whole new breed of super-lightweight, ultra-long-range advanced battery vehicles. 400 miles per charge (..so we're told -see quote below) is not at all unrealistic - with quick-charge capability to boot. 1) Paul MacCready - now President and CEO of Aerovironment, the company that joined with NASA to develop the world-headline-making Helios high-altitude(96,863 ft.) solar-electric airplane(UAV - Unmanned Aerial Vehicle). MacCready, the brains behind the original GM Impact(later the EV1), has been honoured in 2003 with two prestigious awards - the Heinz Award for Technology, the Economy and the Environment as well as the Bower Award for Achievement in Science and Aviation. - "400 mile a charge battery EV's"
"..the Model U could easily be reconfigured to be a pure EV with a 400 mile range and be rechargeable in just minutes. Sound impossible? McDonough doesn't think so. He indicated to EV World that he and Paul MacCready -- the developer of the original Impact EV that became the GM EV1 and the legendary head of Aerovironment -- share a common vision and are excited about some promising new battery and motor technology that will make this dream a reality. EV enthusiasts have heard this story before, but both McDonough and McCready have long track records of delivering what they promise." "To date, production EVs and HEVs have focused on NiMH technology but, with this achievement, Compact Power has proven that LiPB can be used for automotive applications. LiPB technology has already replaced NiMH in many computer and cell phone applications. "We raced to prove that our present development course is correct" stated Dr. Dan Rivers, President and Chief Executive Officer of Compact Power. "Now we know that LiPB technology holds the future and we will accelerate our efforts to develop this technology. We plan to participate in this race again and hope to break the 10-minute barrier in the future. This mark has never been broken, and if done in an EV, will further stimulate the market and speed up the commercialization of EV and HEV platforms." "We're now working hard on next generation lithium ion polymer battery technology for electric vehicles -a fledgling market that's expected to take a major step forward toward becoming a mainstream part of the US auto industry in 2003." See full LG Chem press release. 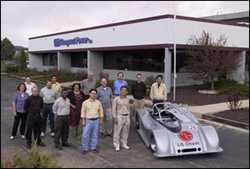 See also: EV World feature "ER2 Conquers Pikes Peak"(Bill Moore, Jan 2003) " . Compact Power's Le Mans-style ER2 - powered this time by lithium ion polymer batteries from CPI's Korean partner LG Chem - reaches summit of Colorado's Pike Peak in record time for an electric vehicle. So there we have it: Paul MacCready and Dan Rivers - two remarkable electric vehicle pioneers and trailblazers - each still fully committed to the realization of a shared dream and to the radical reinvention of a ZEV technology that so many doubters seem so increasingly desperate to write off and misrepresent. We wonder if their paths will cross again - and what they will be driving when it happens.